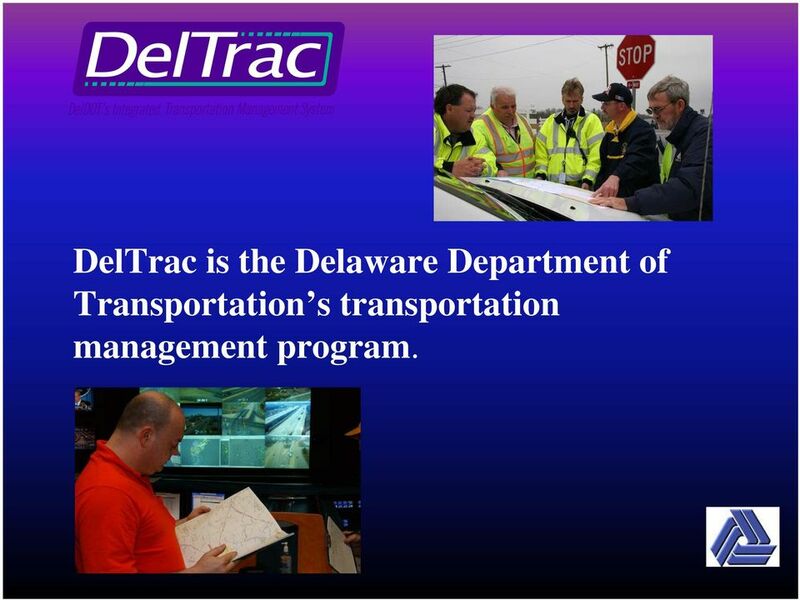 Download "Delaware s Transportation Management Program"
2 DelTrac is the Delaware Department of Transportation s transportation management program. 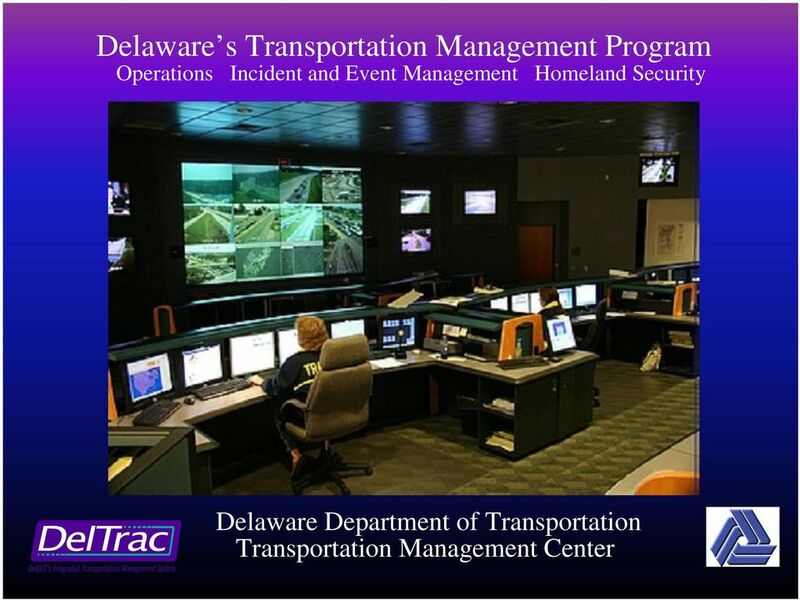 12 Transportation Incident and Event Management The TMC coordinates the planning and management of DelDOT s response to daily incidents and events to include: Accidents Disabled vehicles Debris in roadway Construction Planned Emergency Traffic signal complaints Missing or damaged signs Traffic operation complaints Detours Etc. 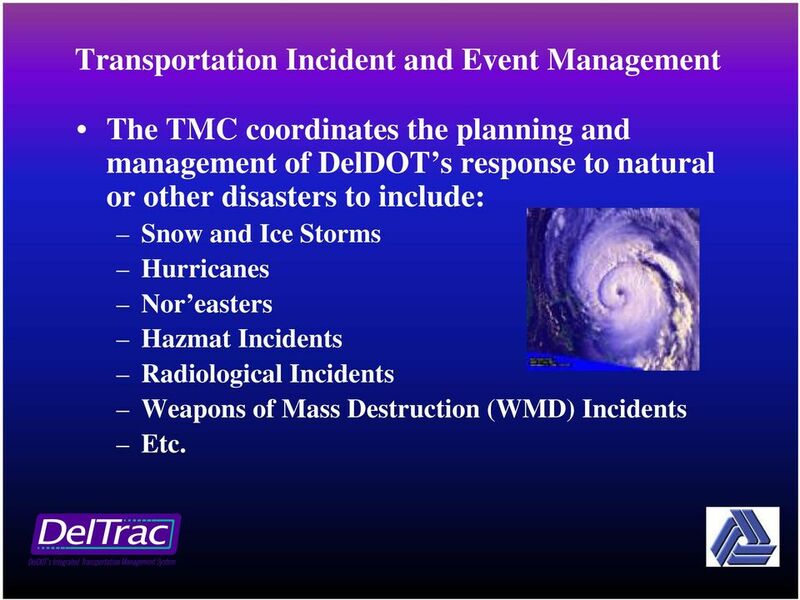 14 Transportation Incident and Event Management The TMC coordinates the planning and management of DelDOT s response to natural or other disasters to include: Snow and Ice Storms Hurricanes Nor easters Hazmat Incidents Radiological Incidents Weapons of Mass Destruction (WMD) Incidents Etc. 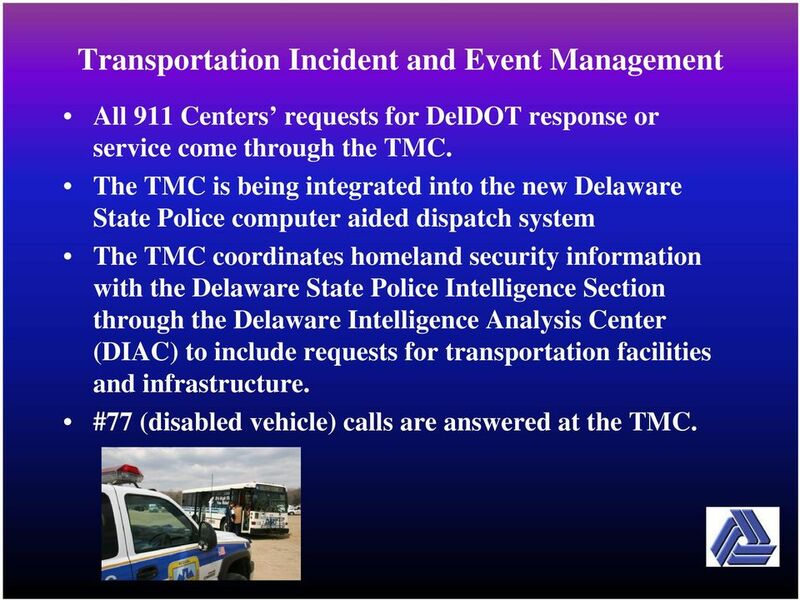 15 Transportation Incident and Event Management All 911 Centers requests for DelDOT response or service come through the TMC. 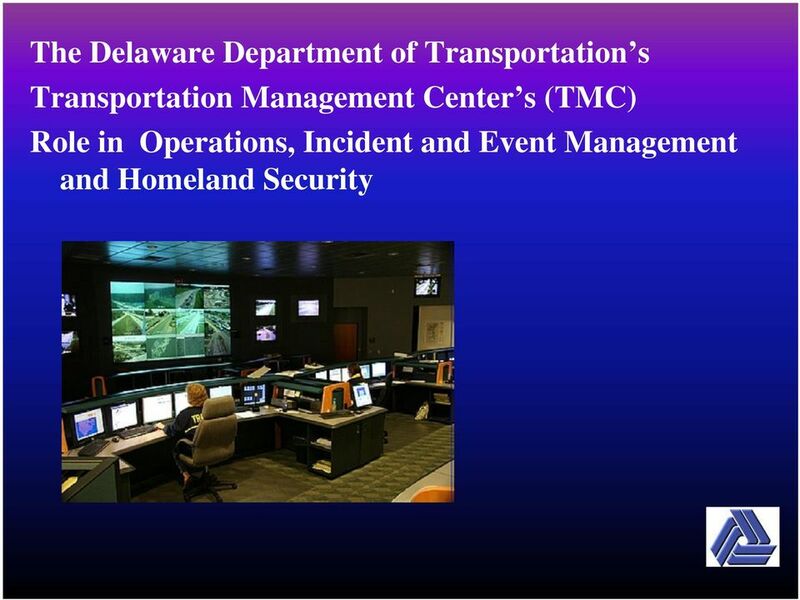 The TMC is being integrated into the new Delaware State Police computer aided dispatch system The TMC coordinates homeland security information with the Delaware State Police Intelligence Section through the Delaware Intelligence Analysis Center (DIAC) to include requests for transportation facilities and infrastructure. 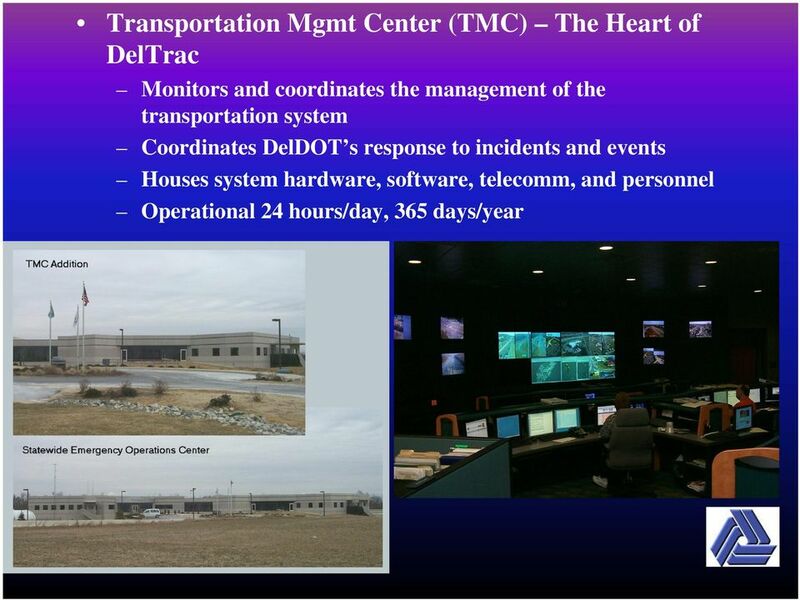 #77 (disabled vehicle) calls are answered at the TMC. 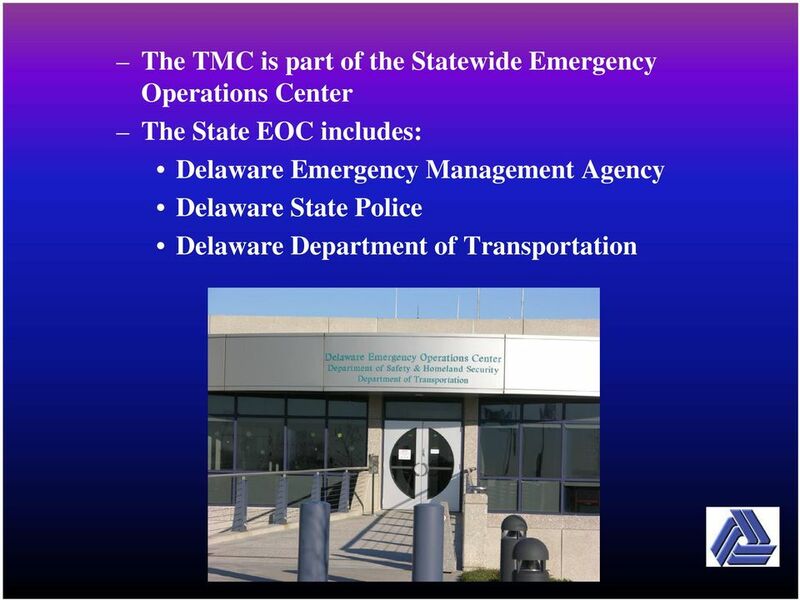 16 Transportation Incident and Event Management Requests for DelDOT response and service from the State Emergency Operation Center (EOC), county and municipal EOC s are managed by the TMC. 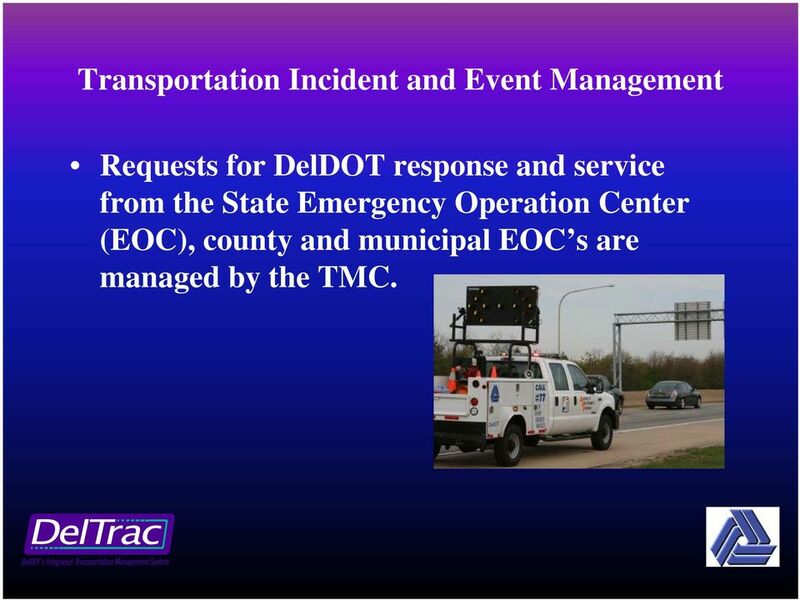 17 Transportation Incident and Event Management The TMC coordinates DelDOT s response to Federal Disaster Declarations. 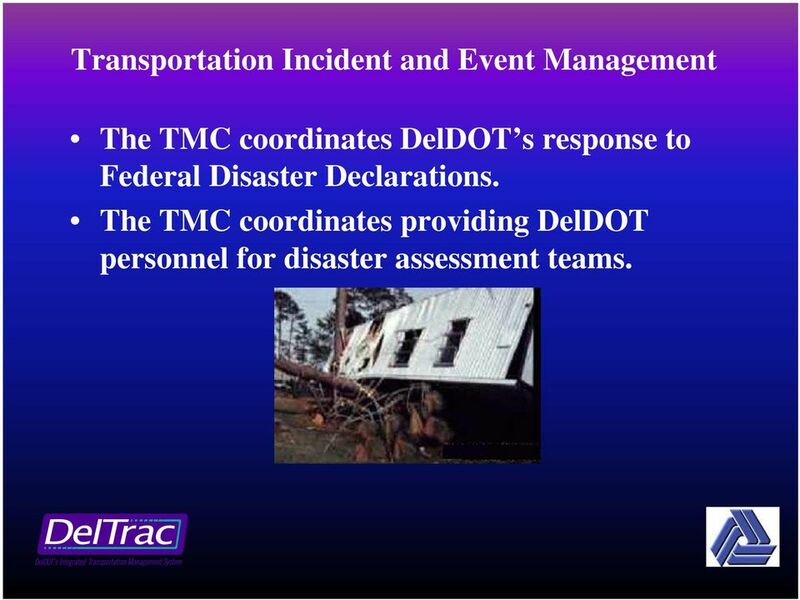 The TMC coordinates providing DelDOT personnel for disaster assessment teams. 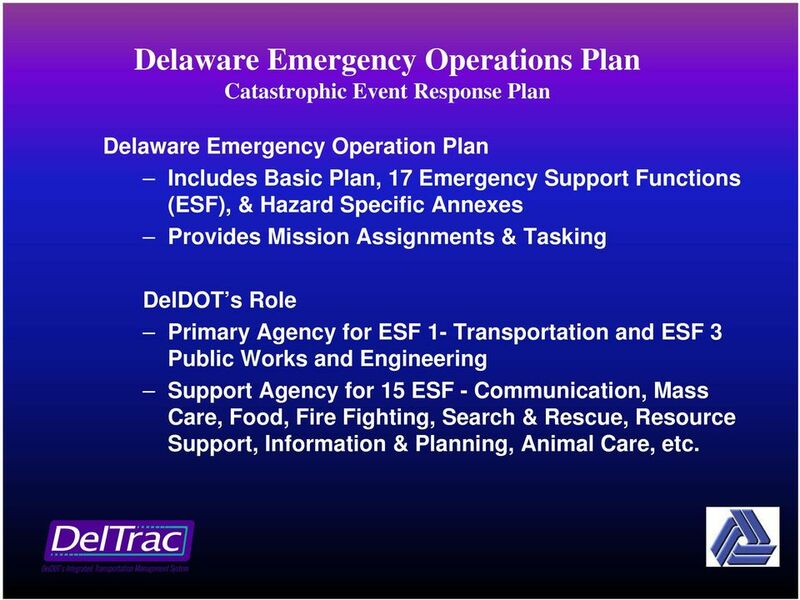 19 Delaware Emergency Operations Plan Catastrophic Event Response Plan Delaware Emergency Operation Plan Includes Basic Plan, 17 Emergency Support Functions (ESF), & Hazard Specific Annexes Provides Mission Assignments & Tasking DelDOT s Role Primary Agency for ESF 1- Transportation and ESF 3 Public Works and Engineering Support Agency for 15 ESF - Communication, Mass Care, Food, Fire Fighting, Search & Rescue, Resource Support, Information & Planning, Animal Care, etc. 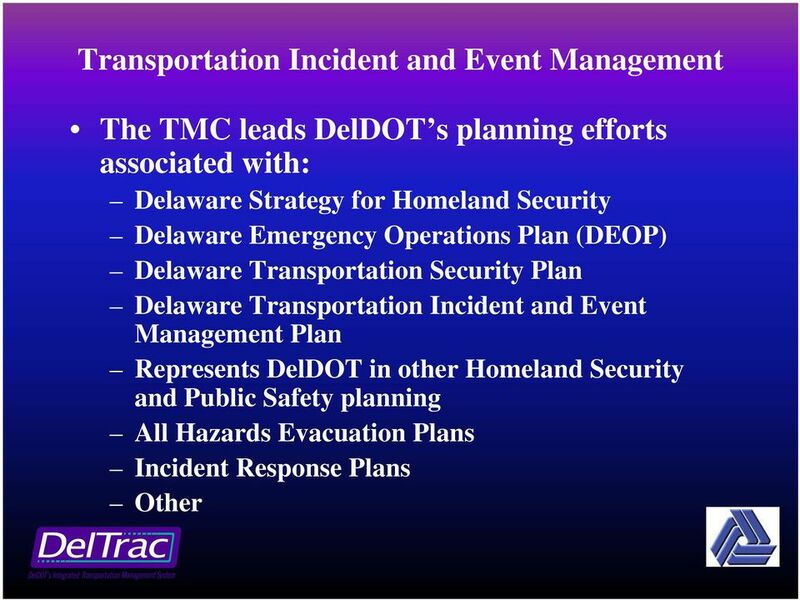 21 Transportation Incident and Event Management Plan Developed with input from all DelDOT divisions and other agencies to include police, fire, emergency management and others at the state and local level. 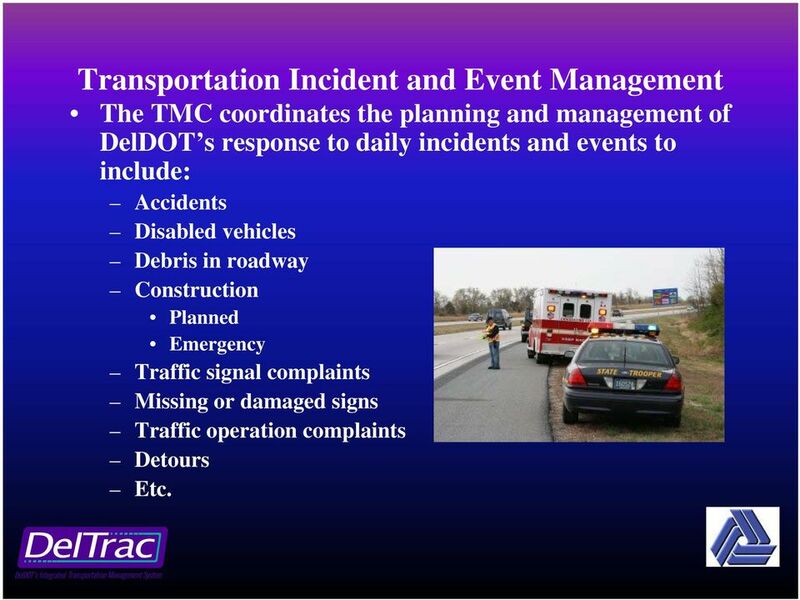 22 Transportation Incident and Event Management Plan Level of Response to the Level of Incident Purpose - To define the communication, response, resource and responsibility procedures and guidelines of the Transportation Management Teams (TMT) for response to any event or incident that impacts the transportation system. 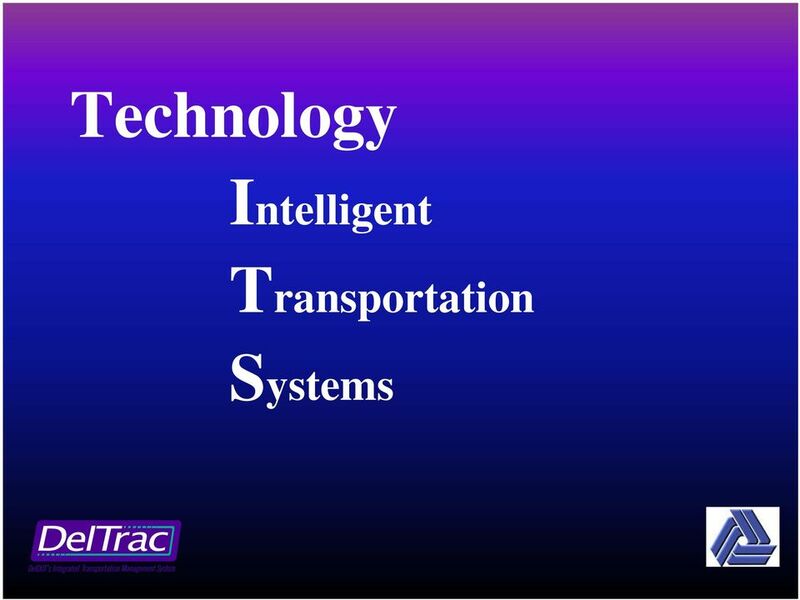 To establish the TMT concept that will maximize the safe movement of persons and vehicles from the affected area(s), and give emergency personnel access to the affected area(s). 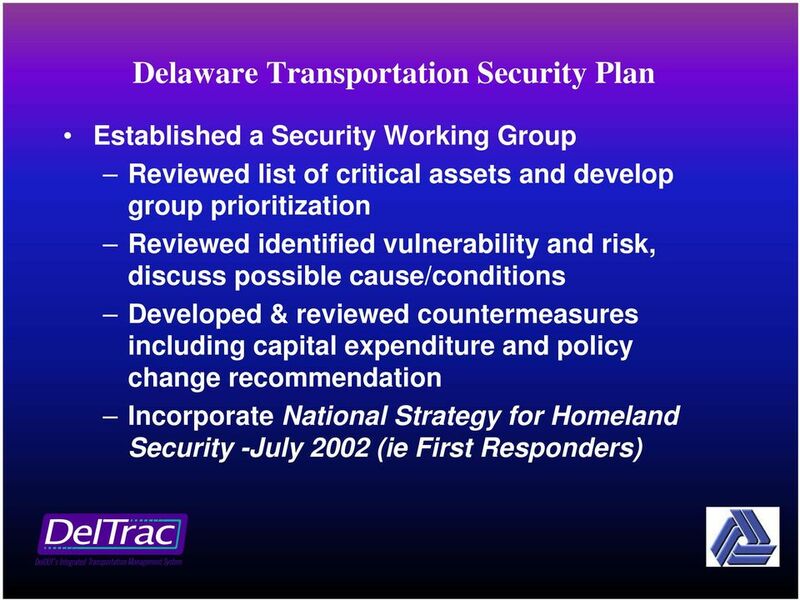 To establish the TMT responsibility for the prompt, safe, and orderly re-entry of evacuees into the evacuated area once the incident or event no longer exists. 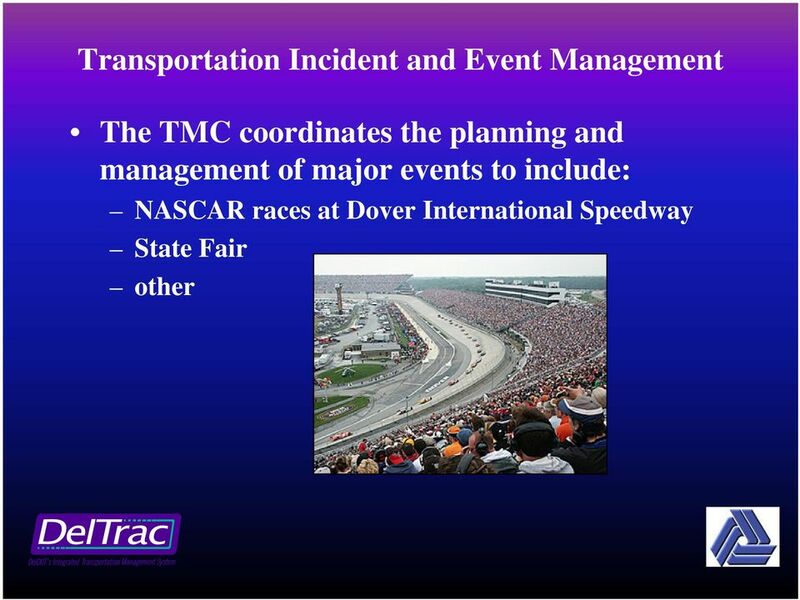 24 Transportation Management Teams (TMT) Jointly make decisions on how an incident or an event that impacts the transportation system will be handled. 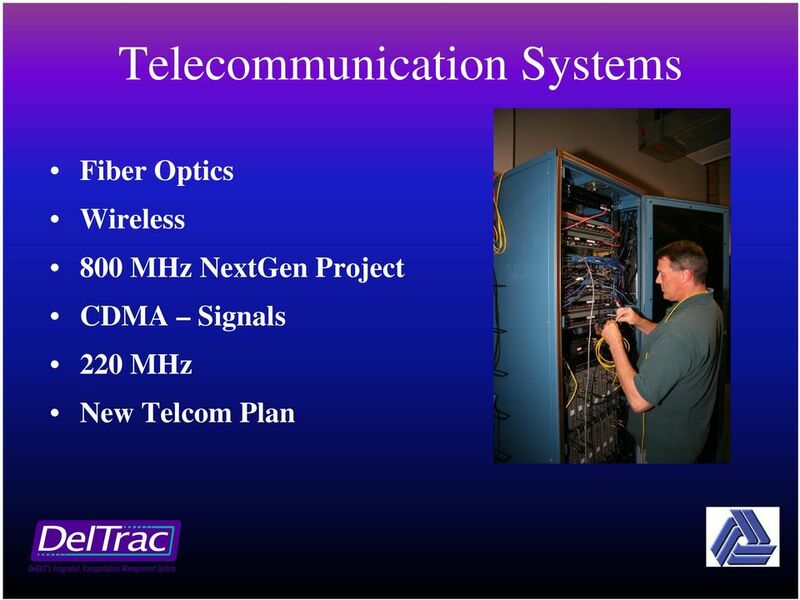 Work within the National Incident Management System (NIMS) framework and Unified Command Structure TMT Keys to Success Establish communication procedures. Define roles and responsibilities. Establish policies and procedures. Identify the available resources for different areas. 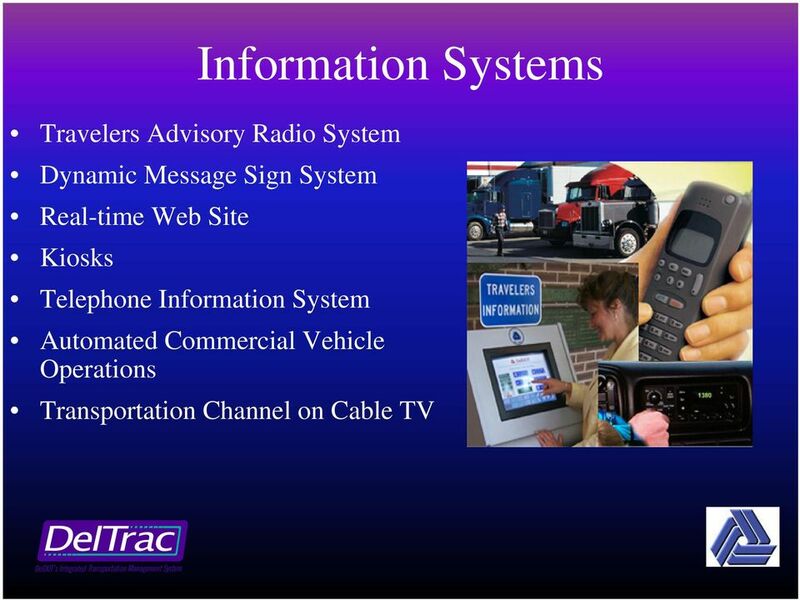 People Vehicles Equipment Materials Establish planning and training exercises. 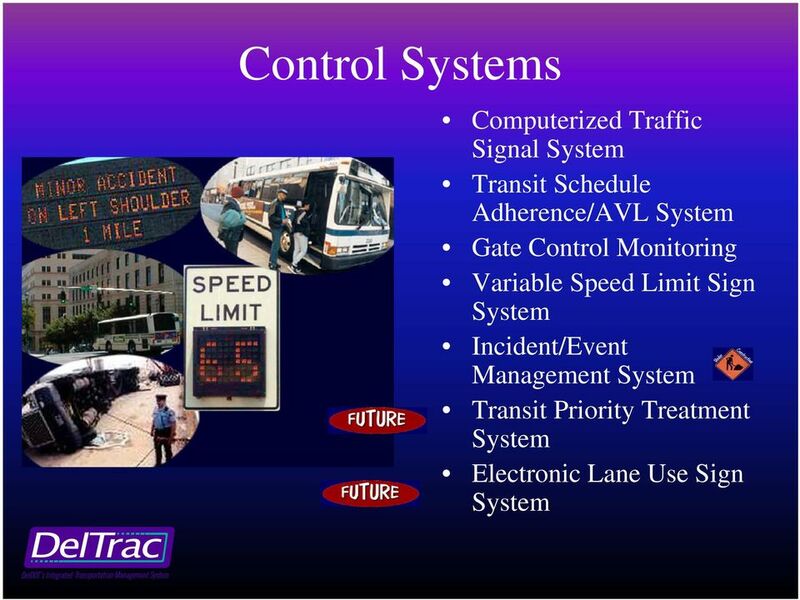 34 Traffic Control Plans Each TMT is developing Traffic Control Plans for incidents that close sections of the state s major road network. 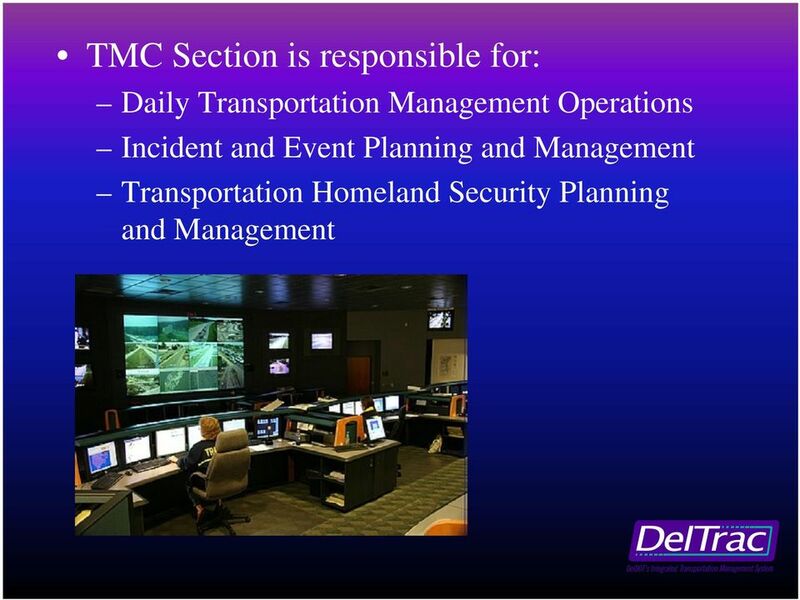 The TMTs are developing detailed traffic control plans to be used in conjunction with evacuation and response plans. LARIMER COUNTY COMPREHENSIVE EMERGENCY MANAGEMENT PLAN. Larimer County Emergency Management 200 W. Oak Street Fort Collins, CO 80526. www.larimer. 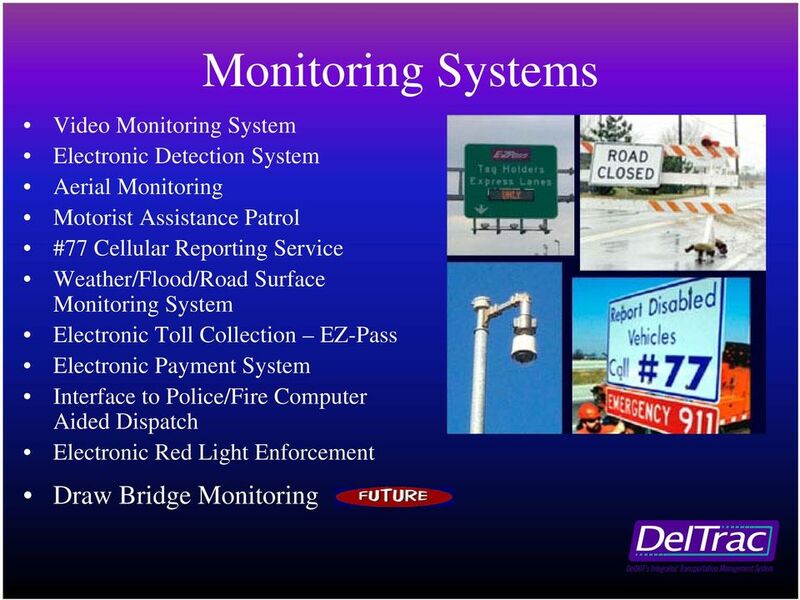 Monitor and report status of and damage to the transportation system and infrastructure as a result of the incident.